I have compiled a list of well-written and informative books on home brewing for those of you who are either considering becoming a home brewer or recently started home brewing. Many of these books are also very informative when it comes to advanced brewing topics such as all grain brewing and understanding the importance of the water you brew with. My top pick is How to Brew by John Palmer. It is basically the home brewer’s bible, and if you were going to get just one book, this would be the one that I would recommend. Next up is Designing Great Beer by Ray Daniels. Ray’s book will help you take your brewing to the next level with his detailed guide on how to design a great beer. It is packed with valuable information. Jamil Zainasheff has written a fantastic book covering the ins and outs of beer fermentation, and this is a great read if you are looking to learn more about yeast the specifics of fermentation. Okay, so this last one is software and not a book, but it is still very informative when it comes to how to design a beer and understanding some of the more complex principals of home brewing. BeerSmith v2 is the software that I currently use and I can not recommend it highly enough. A recent trend for microbreweries and home brewers is to impart oak flavor upon their beer. Imbuing a beer with an oak flavor can be a good way of adding complexity or mellowing out other strong flavors in a beer. Beer styles that typically benefit most from oak flavors are higher gravity stouts, porters, sours, traditional English Ales, and some Belgian ales. It is always important to use caution when adding oak to your beer because it is easy to overdo it and end up with a beer that tastes like a desk. Factors that impact the degree of oak flavor are the ABV of the beer, age of the oak, ratio of oak to beer, type of oak, toast of the oak, previous use of the oak, surface area, aging temperature, and aging time. There are a lot of available options when it comes to imparting oak flavor on your beer. You can age the beer in an oak barrel, or you can add pieces of oak to your fermenter and age your beer with that oak. If you choose the latter option, you will need to decide if you want to use oak cubes, oak chips, previously used oak barrel pieces, an oak infusion spiral, or just chunks of oak. Each option has different potentials for flavor, so make sure that you choose the one that is right for you. Oak cubes tend to be the most popular with home brewers. For most styles, you will want to add about 2 oz of medium toast new oak cubes per 5 gallons of beer, and allow it to age with the beer for 2 weeks to about a month. I would recommend sampling the beer each week to see if it has acquired the right amount of oak flavor, if it needs to be aged longer, or if it needs to have additional oak added. 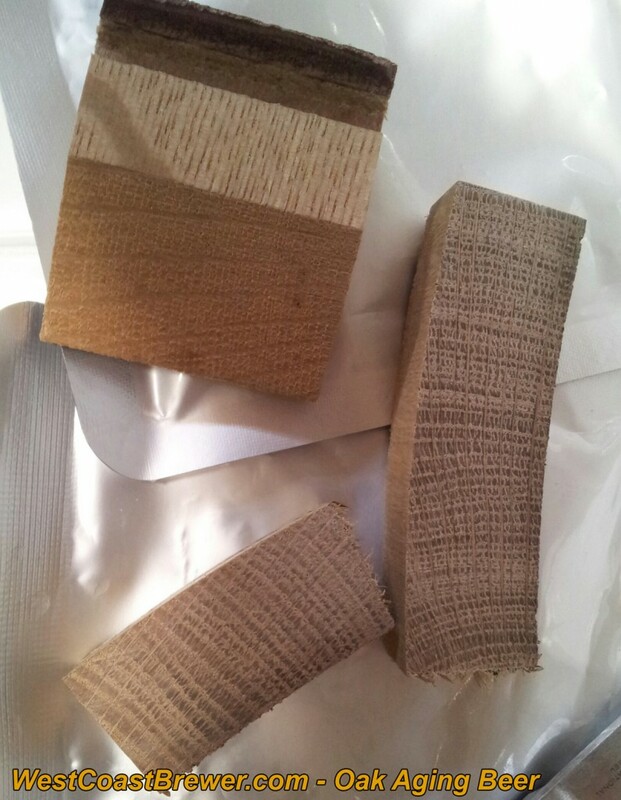 Here is a photo of the oak cubes that I added to my Russian River Consecration Clone. They were actual chunks of previously used Russian River Consecration barrels. I allowed the beer to age with them for about a month. In regards to my Russian River Consecration clone, I first soaked the oak cubes in a Cabernet Sauvignon. Vinnie from Russian River recommends using a bottle of Kenwood if you will be soaking your cubes first. I highly recommend the kit, but make sure you have at least 6 months available for the beer to finish up. Just let me know if you have any questions. There are a few options available for the home brewer when it comes to kegs. Home brewing kegs come in a variety of sizes, can have different post designs, and may oftentimes be purchased either new or used. If you purchase a used keg that has not been refurbished, or if your previously new keg is getting a little older, it may be time to replace its seals. Kegs use a series of silicone seals, o-rings, and poppets in order to keep the keg both air and liquid tight. These seals are important, as they insure that your beer does not oxidize, lose carbonation, allow external bacteria in, or shower you in beer when you pressurize the keg. Time, temperature, and wear will degrade these seals, and it is wise to replace them before they fail. 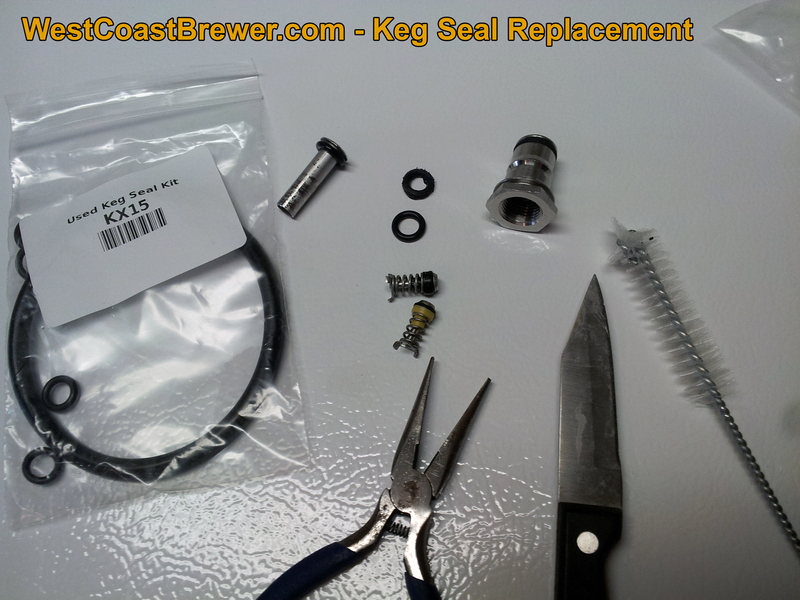 Most home brew suppliers will sell keg seal replacement kits, and the process is relatively inexpensive and easy to perform. There is a poppet and o-ring in each post, so you will need to remove the post in order to replace the seals. There is also an o-ring at the top of each post that creates a seal with the CO2 tank connections. Lastly, you will want to replace the seal for the keg lid. All you really need is a wrench and a pair of pliers in order to perform the replacement, and it takes just a few minutes to do. 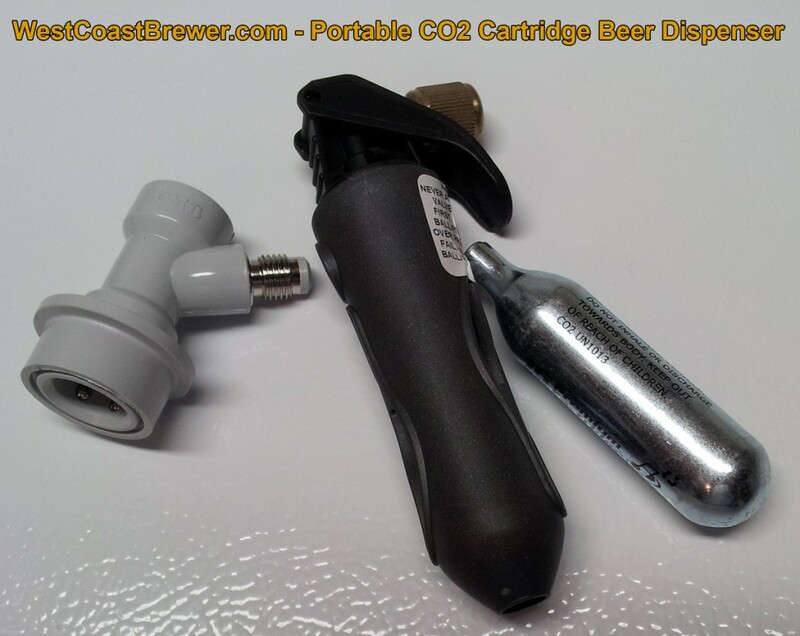 I purchased one of these portable CO2 cartridge-based ball lock keg injectors about a year and a half ago, and it has been one of the best purchases that I have ever made. Instead of having to lug around my 10 pound CO2 tank to a party, I just ramp up the keg with CO2 from the tank. When the pressure drops too low to push, I connect this device, and one CO2 cartridge is enough to empty out the remainder of the keg. It is small enough to fit in my pocket and super easy to use, just make sure that you follow the directions properly or else you can blow your ball lock/pin lock gas valve. So far I have used it on about 5 different occasions and it has never let me down. It even held pressure between uses. A Graf or Graff is a term used to describe either an apple cider that has been hopped, or a beer where apple juice or cider has been added to the wort to enhance the flavor of the finished beer. Graf beer seems to have recently become more popular in the home brewing community. A couple of months ago, I decided that I would try my hand at creating an Oktoberfest Graf Ale hybrid beer. I wanted to capture the feeling of the harvest in my beer without producing an overly fruity flavor, and figured that an Oktoberfest Graf Ale would be the perfect match. I was very pleased with the final product, and it was well received by everyone who tried it. I kept the apple cider level to only 16% of the total wort so that it would only accentuate the beer instead of taking the focus away from it. As the beer fermented, the majority of the apple flavors were removed from the graff; in fact, before I told those who had a glass, most were unaware that it had apple added to it. On my next batch, I may try going as high as 25% to pick up a bit more of the apple, but to be honest, I am very happy with the outcome and may just replicate the recipe next time around. You may also want to consider back sweetening your graf as well, if you want some extra sweetness. 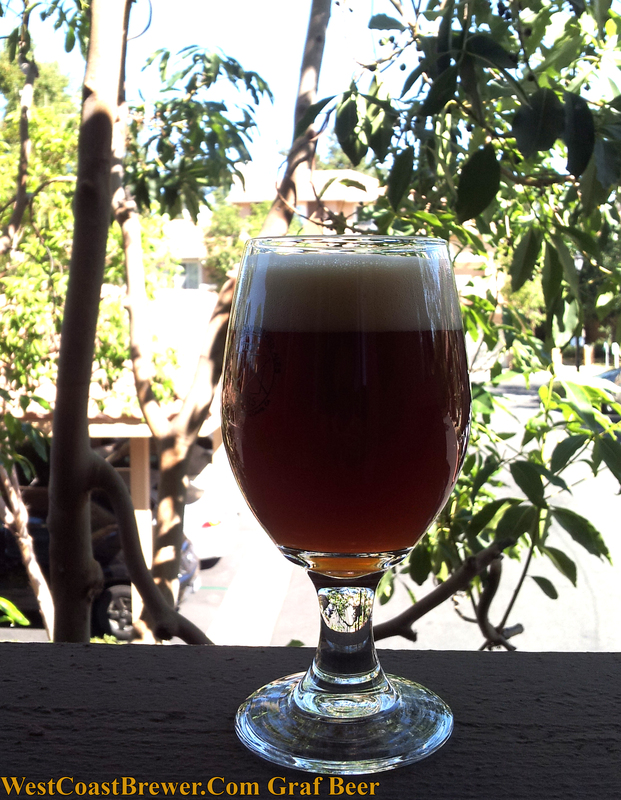 Here is a quick version of the West Coast Brewer Oktoberfest Harvest Graf Ale all grain recipe (6 gallons). Drop me a line if you have any questions and happy brewing! Here is a photo of the graf beer. It still needs to age for a while to bring a bit of the haze out, but aside from that, it is delicious and ready to consume!